It seems like everyday, a new cosmetic product is announced that will make us look younger, smooth out imperfections, or firm us up. While new technology and trends are exciting, often, the best solution has been around for ages, never having seen the inside of a laboratory. 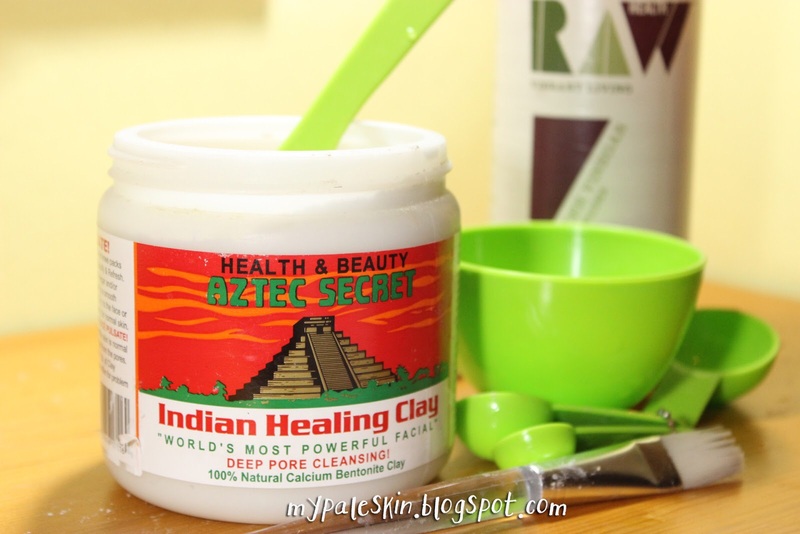 How I found Aztec Secret Indian Healing Clay is an absolute fluke, but it turns out this excellent product dates back to early humans and already has a cult following. Last month, my local Ralph’s was having a store-wide closing sale. Skincare products were among the great bargains. As I scanned the nearly empty shelves, I spotted a bright red label with an image of golden, pyramidal ruins. With such an intriguing label, I had to try it. I discovered it is a great product, and I regret not snagging the other remaining jars. The tub’s colorful label boasts that it’s the “world’s most powerful facial.” And judging by its overwhelmingly raving 6,296 reviews on Amazon (rating of 4 1/2 stars), perhaps this is not an over-statement. The mask is 100% calcium bentonite clay, which you mix with equal parts raw apple cider vinegar or water to create a spreadable paste. Aztec Secret recommends using a glass, pottery, or wooden bowl. 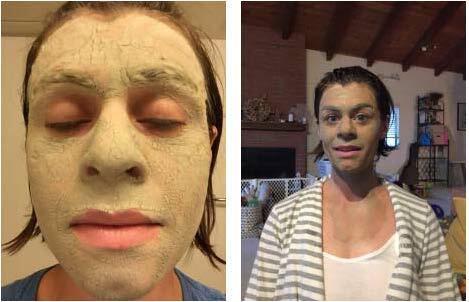 Bentonite clay, an absorbent, lifts excess oil from the skin, but it won’t eliminate acne-causing bacteria. Apple cider vinegar is therefore key, as it has antimicrobial properties that can reduce propionibacterium (bacteria) on the skin. After making the mixture and stirring it to a smooth paste, apply a 1/8 to 1/4 inch-thick layer of clay to the face or other areas and let it dry. Aztec Secret states that drying times vary but are generally five minutes for delicate skin and 15- 20 minutes for normal skin. You will feel a pulling and tightening sensation. After it dries, remove it by washing with warm water. You may have a slight redness after removal, which is normal and should disappear within 30 minutes. I mixed a heaping teaspoon of Aztec Clay with a heaping teaspoon of raw apple cider vinegar. 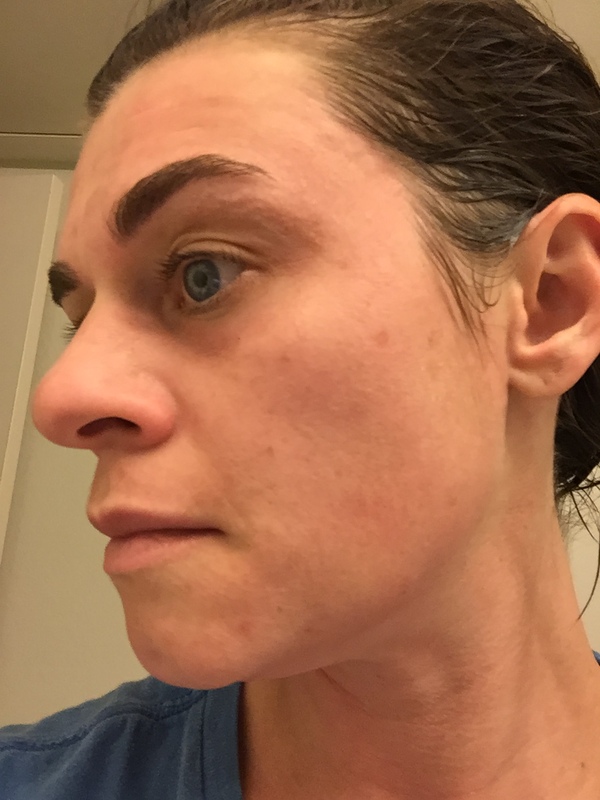 Seconds later, a thick paste formed, and I applied a thick layer of it to my entire face and neck (on the second use, I included my decolletage, too). Even though the label specifically warns of a strong pulling sensation – “feel your face pulsate!” – I didn’t fully expect it. After eight minutes, I experienced substantial pulsating, particuarly in my nose, and I felt like my face was being cinch-wrapped. After 15 minutes, my face was mummified; the clay had dried completely and begun to crack with any facial movement. I loved the sensations; they made the mask feel legit. Apply while watching The Walking Dead, like I did, if you want a 4D experience! But I particularly loved the result. Post-facial, my face felt supple and soft and looked noticeably brighter, all of which suggests good exfoliation. I left my mask on for a full 45 minutes because I wanted to maximize benefits (see Father Kneipp’s Original Recipe below), and I didn’t have any irritation. I was also curious about the level of redness I might observe. 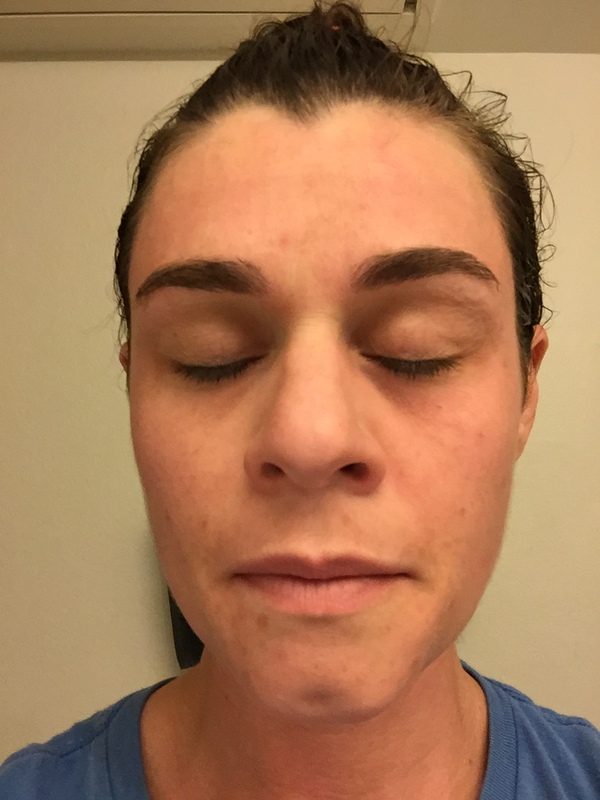 Any agitation to the skin results in redness, so I expected exactly what occurred: a mild, patchy redness that resolved in 20 minutes. I experienced a concurrent warm sensation in my cheeks that was subtle and non-intrusive for those 20 minutes, as well. As I said, I’ve now done two masks, a week apart, and I can’t even see a dent in my tub of Aztec Clay. (left) First use at 45 minutes, about to rinse. (right) Second use, included decolletage, at 5 minutes and not completely dry yet. 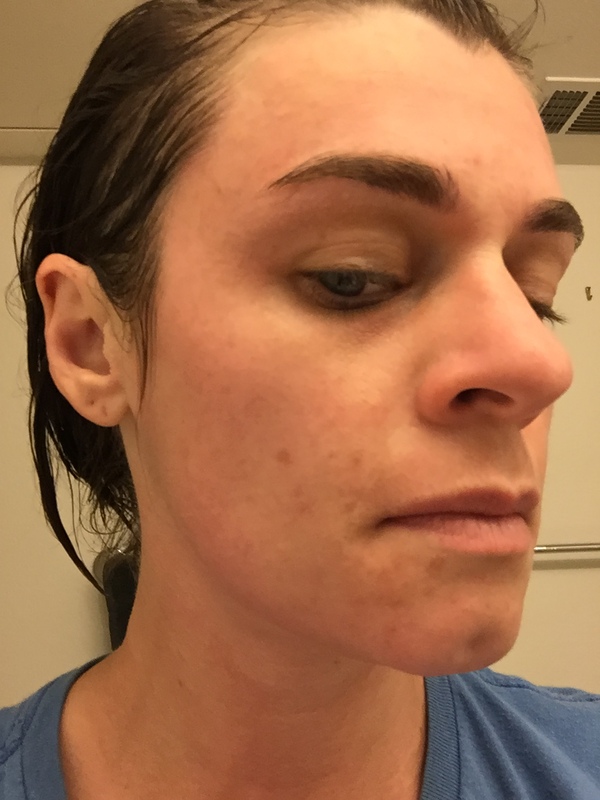 immediately after rinsing; mask left on for 45 mins. Most experts advise no more than two masks per week, warning that higher frequency could result in skin dryness and excess irritation. I think this depends on one’s skin sensitivity. Interestingly, the makers of Aztec Secret, and many bloggers in kind, warn against allowing the clay to contact metal. This warning has nothing to do with an impact on efficacy. In fact, bentonite clay contains salts that create an ionic charge when dissolved in water, and metal has no effect on this reaction. Rather, some metals, such as canning jar lids and coffee cans, quickly rust or even deteriorate when left in contact with bentonite. Thus, it’s okay to mix the clay using a wire whisk or in a metal bowl; just be sure to wash off the clay immediately and thoroughly after use. Mix equal parts of Aztec Secret Indian Healing Clay with apple cider vinegar (raw and organic is best) in a bowl. You should use glass, plastic or wooden bowls and spoons – no metal! Apply to the face and/or body and allow to dry up to 45 minutes. Rinse off well with warm water only. Mix equal parts of Aztec Secret Indian Healing Clay with brewed green tea and 500 mg. of Vitamin C with bioflavonoids (open the capsule). Apply to the skin, allow to dry, and rinse off well. *Green tea is currently being studied for its antioxidant, antibacterial, and cancer-fighting properties. Mix equal parts of Aztec Secret Indian Healing Clay with brewed Pau d’Arco Tea and five drops of tea tree oil. Apply to the feet, especially in between the toes, let dry for 30 minutes, and rinse off well in warm water. Mix equal parts Aztec Secret Indian Healing Clay with apple cider vinegar, add one tablespoon of raw honey. Apply to skin, allow to dry for 10 minutes, and rinse off with warm water. This mask is similar to a mask used by Cleopatra in her beauty ritual. Mix one pound of Aztec Secret Indian Healing Clay with one pint of apple cider vinegar. Apply a thin coat of the mixture to the body and allow to dry for 15-20 minutes. Rinse off well in the shower. One pound will serve two people. ← Did I Mention I’m Airbrushed, and It’s Customized?